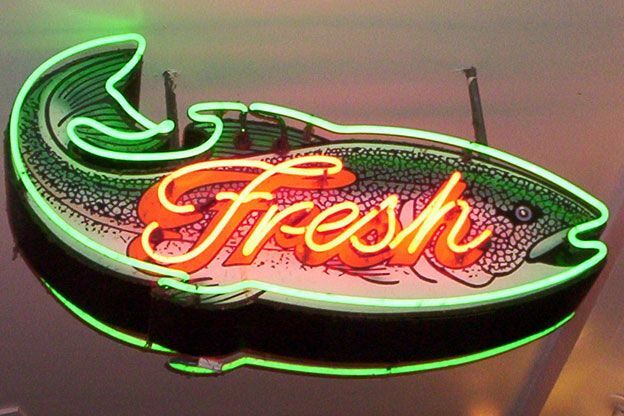 “Fresh” is a strange word. Like “natural,” it’s very difficult to point to what it means. The PBS series Mind of a Chef devoted an entire episode to exploring the slippery concept of fresh. We like to think that “fresh fish” means that the animal was taken out of water just yesterday before being lovingly and carefully transported across the country, continent, or globe to reach the display cases of our fishmongers and supermarkets. But only rarely is this the case. The reality is much more complex and gritty than we might like to consider. It can take up to 10 days for a fish to make the journey from fishing vessel to consumer. By the time you purchase an item, it may have already had five owners: The captain of the boat sells it to a processor, who sells it to a distributor. The distributor sells it to a wholesaler. The wholesaler sells it to a retailer who then sells it to you, lucky number 6. Between the water and your hands, the fish has been handled by a myriad of people, been in a number of boxes, cases, and vacuum bags, and has been on at least two modes of transportation. But frozen seafood isn’t necessarily a bad thing. Frozen fish travels better. It’s also safer. Big names in sushi have been freezing fish for decades. In fact, earlier this year, New York City issued a mandate that fish be frozen before being served raw in order to kill parasites. Many modern fishing vessels freeze fish immediately after they’ve been caught and sorted to preserve them on longer return trips to port. Much like the deep waters from whence these eats hail, the industry surrounding freshwater and seafood products is murky and complex. I’m nowhere near qualified or learned enough to attempt to cut through all of the layers with an authoritative explanans. But I do know a bit about selecting, using, and eating seafood. The next time you find yourself at the fish counter, follow the tips below to ensure you’re getting the freshest possible product. Whatever that may mean. If you’re purchasing whole fish, examine the body cavity. There shouldn’t be large amounts of blood, but what is there should look bright red, not dark and pasty. Don’t be modest; it’s okay to smell the fish. Unabashedly nose the the body cavity of the entire animal. Fish that smells, well, fishy, is not good eats. Good quality fish ought to possess a clean smell. If the product smells disagreeable in any way, do not buy it. Touch the whole fish on the skin. Press the flesh gently but firmly with your thumb or index finger. It should feel solid and bounce back. If your finger leaves a dimple in the flesh, it has too much age on it and is not good eats. Eyes on a whole fish ought to appear glistening and bulge outwards, not sink into the orbit. Cloudy eyes do not necessarily indicate that the product has age on it–it happens when the fish comes in contact with ice. Many seafood processors remove the gills, but sometimes they may be present. If the gills are still present, they should be bright red in appearance, not a matte brownish color. For processed product likes filets and steaks, the flesh should appear glossy. As the product ages, it will lose its sheen. Frozen fish lose water content. On frozen items, they should be frozen solid, without any mushy spots. Large amounts of freezer burn or ice on a product indicates that it has been thawed and refrozen at least once. When buying shellfish, look for ones with shells that are tightly closed. This indicates that they are still living. Shells that are slightly opened, on the order of 1 to 5 millimeters (roughly 1/16 to 1/4 of an inch), should be tapped with a fingernail or knife. Shellfish naturally open up a bit when they are seeking moisture. After the tap, the shell should snap closed, indicating that the organism is still alive. If it doesn’t budge, it has died. Not good eats. Already-shucked shellfish should have a healthy appearance and pleasant smell. Bring to the attention of your fishmonger any specimen that has an odor of ammonia or sulfur. Any liquid present should be clear or translucent, not have an opaque or milky appearance.